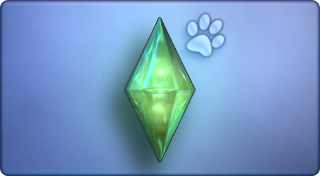 Praise or scold a pet enough times to add a trait. Train a pet to have 9 traits. Earn more than §1,000 during a trick exhibition. Breed a Natural-Born Hunter cat or Natural-Born Digger dog. Become a BFF with a dog. Fetch something worth at least §2,000 with a dog. Steal something worth at least §2,000 with a cat. Use a telekinetic cat to make a Sim fix a meal from the fridge. Complete each of the parenting Challenges. Complete each of the fishing Challenges. Complete each of the love and romance Challenges. Send a simbot back in time. Find a special plant while fishing. Complete each of the Cat-astrophe scenario Challenges. Complete each of the k9 cop scenario Challenges. Have a dog and a cat become best friends. Make a Sim transmogrified from a cat and a Sim transmogrified from a dog become a couple. Activate the Cry Havoc karma power during a wedding party. Make out with the maid. Have your Sim kiss their brother’s/sister’s best friend. Escape a karmic backlash by quickly balancing the meter after dropping below -50. With a pet, steal a Sim's clothes who is skinny dipping. Destroy §10,000 worth of objects with a dog or cat. Complete each of the Leonardo Reborn Sub-Challenges. Catch every ghost spawned by the Ghost Invasion karma power before it ends. Target your neighbor with the Ghostify Power, then catch them with a cat or Ghost Zapper. Complete each of the mystery chapters. Discover the lost pirate ship anchor. Avoid the zombie bears to find the pirate ship's log. Deal with the feline in the Dog Days of Summer mystery. Explore the Abandoned Mine in search of Timmy. Punish the Sims for their crumb-filled, sub-standard furniture. Get the attention of the Socialite Club. Build your house from the ground up by replacing your property with an empty lot. Build a house with 5 stories and an unfurnished value of at least §100,000. Reach level 10 of a career. Complete each of the Sim happiness Challenges. Complete each of the relic collection Challenges. Complete each of the dancing Challenges. Complete each of the exhibitionist Challenges. Complete each of the explorer Challenges. Promise and complete a pet-related Lifetime Wish.